Recognize anyone? Where? Year? Occasion? See commentary below. Click peopled portions of photo for close-ups of RMSC Transition Team groupings (left, center, right). 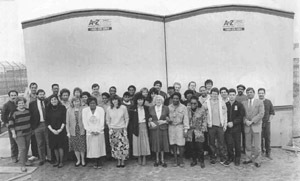 Above are three images sectioned off from a group photo of the Transition Team for the Rose M. Singer Center (RMSC) about 1986 or 1987. 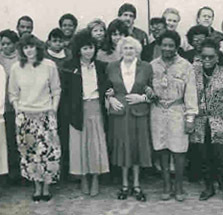 The very elderly Rose M. Singer herself can be seen near the center of the front row. The three section images are so positioned as to appear a single image. Clicking on any one of these three section images -- left, center, or right -- accesses a corresponding close-up view of the people in that section. Each of the close-up section image pages provides navigation links to move between the three close-up view pages or to return to this page. Double click this image to access a 220 Kb Adobe Acrobat PDF 9.5-by-5.7 inch grayscale image (single, un-sectioned) of the group, downloadable and printable. Use your browser's "back" button to return to this page. Correction Officer Norberto Velez, assigned to the NYC Correction administration staff at 60 Hudson St. Manhattan, provided this photo to the New York Correction History (NYCHS) as an email PDF image attachment. 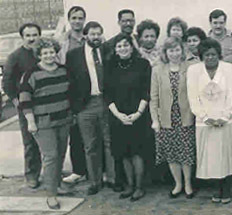 "I was cleaning out my closet at home and came across this picture which I believe was the transition team for the Rose M. Singer Center (1986 or 1987). You can see Ms. Singer in the middle and Warden Robert Brennan way right on the picture. I know a handful of others too. I hope you can post this and have people give feedback and names and hopefully bring back some nice memories for others." Officer Velez added:"I am not in the photo. I arrived at RMSC June 1988." The 20-year-old photo has been passed around electronically among about a half-dozen former RMSCers to see if they can recall the names of those who are shown in it, when it was taken, the occasion for taking it and where. "This was probably taken around April or May of 1988. I don't believe it was in 1987 because I began as Warden Brennan's secretary on transition in November 1987 and I suspect it would've been too cold to stand outdoors at that time without a coat but who knows!" "Capt. Audrey Reilly is in the photo but was actually visiting us and got into the group picture. But I don't believe she was formally a Transition Team member. "The Transition Team really was the group that was responsible, from soup to nuts, for getting the jail ready to open as the Department's new facility for female inmate. It started with the assigning of the Sr. Execs (Warden Brennan, DW DeRosa, Francesca DiGirolamo), then several captains and administrative support staff (including Karen Chen and Pam Mitchell who were assigned in 1987). "I was hired in Jan. 1988 and believe the jail opened in June 1988. We worked out of a trailer in front of the building site. In the winter it had a sign hanging outside the door, "Ice Station Zebra." 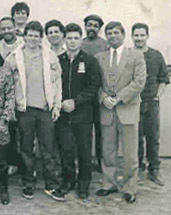 "Team functions included working with Capital Planning on construction issues, working with OMB on required headcount, hiring and transferring necessary staff, writing insitutional orders, working with Health Affairs to set up clinic and nursery operations, with Programs to set up law library and other programs, and with the Board of Correction (especially board member Rose M. Singer herself) to ensure that at least minimum standards were met. "Special training was developed with the Correction Academy since male officers were now being assigned to housing areas in a female jail. The training was for both male and female COs but focused on the difference between male and female inmates, so that those who worked in male facilities could see the different skills needed. "Once the jail opened, the transition team became part of the facility staff. . . .."
"I was there at the then new jail from May '88 until I was promoted to Captain in February of 1990. "Judging by Sara's response, this photo must have been taken in Spring of 1988. It could not have been '86 or '87 as originally suggested, since Sara had not been hired by us yet. "The facility did in fact open in June of 88. Mayor Koch and then PC Ben Ward were given a tour of the facility the day of the ceremony. In fact, the next day, a photo appeared in one of the daily papers showing Mayor Koch looking into an empty (but soon to be occupied) cell. "Officers were lined up in their dress uniforms from the corner of Hazen Street and 19th Ave. up to the Queens abutment of the Riker's Island bridge (I was one of them)." The NYCHS webmaster circulated among the half-dozen former RMSCers a version of the photo with an overlay of numbers in colors (red, blue, green, gold) to help in identifying the 36 individuals in the image. Like the three sectioned-off images at the top of this page, below are three sectioned-off images of the photo with the numbers overlay. Clicking any of the three sections -- left, center, right -- brings up a page featuring a close-up of that section. 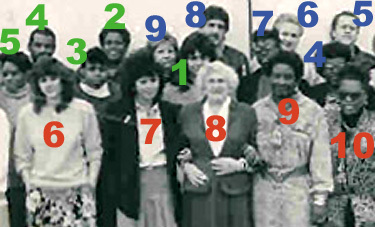 Different colored numbers are used because, in some parts of the photo, using double digit numbers would have blocked out faces. So single digits numbers (1 through 9) were used with different colors (blue, green, gold) after 1 through 15 in red. 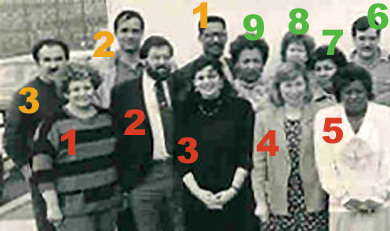 One of those in the photo, Sara Stalkus (red #4), provided names she believes go with some of the others in it. ADA added a few other names to that list. 9. Cherie Braxton? Carlene Maule? Nancy Caride, who confirms she is red #6, enters a dissent on the name suggested above for blue #9. She offers a different name for that spot and also a name for red #15 above now designated "???." 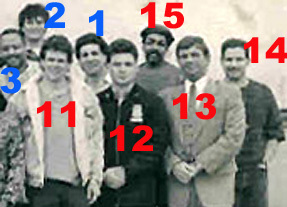 Nancy writes: "Number 9 (blue) in your mystery photo was Officer Devita, not Captain Riley as you have it posted. I worked with Officer Devita for approximately a year and I was part of the Transition Team (RMSC). I am #6 (red) Nancy Caride. Hope you change the name. . . . #15 in red was Officer Minski. I don't recall his first name." Sara Stalkus writes: "I just figured out that Red Numbe #9, standing next to Rose Singer, is not Cherie Braxton but Carlene Maule who currently works at OBCC." Anyone else with information shedding more light on this "mystery photo" can email me at the e-address below.